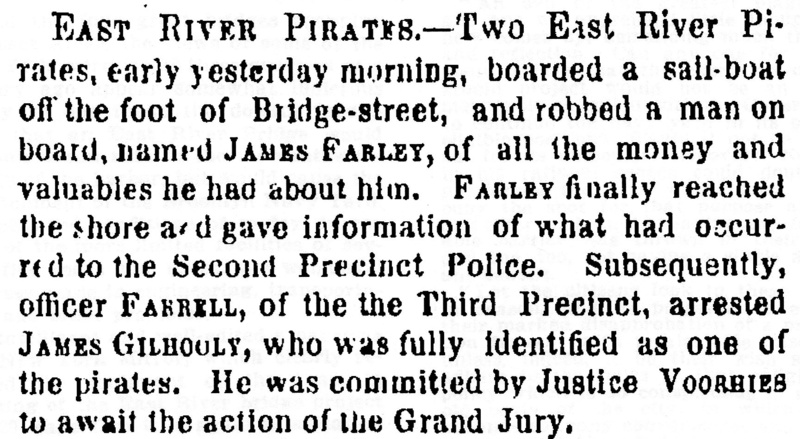 That’s one type of criminal New Yorkers don’t worry about these days: river pirates. But from the city’s beginning through the 19th century, ships loaded with valuables were constantly coming in and out of New York Harbor—easy prey for river pirates. 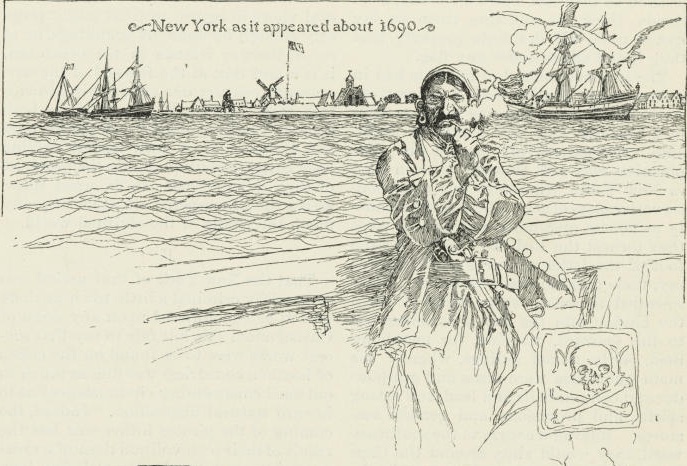 Police were unable, or unwilling, to stop the piracy, reports an 1876 New York Times article. Most notorious of the river pirates in the 1860s and 1870s was the Patsy Conroy gang. Conroy helmed a band of lowlifes who trolled the dockyards of the East River. Another murderous group known for hijacking and robbing ships was the Hook Gang, named for Corlears’ Hook on the East River waterfront. Finally law enforcement got serious about ridding the rivers of pirates. The NYPD formed the “Steamboat Squad” in the 1870s, which drove out most of the gangs by the 20th century. This entry was posted on August 7, 2009 at 5:03 am and is filed under Brooklyn, Disasters and crimes, Lower East Side, Lower Manhattan. You can follow any responses to this entry through the RSS 2.0 feed. You can leave a response, or trackback from your own site. Mark Helprin’s “Winter’s Tale” is an absolute cracker! In fact, it might have been the novel that made me an amateur “NewYorkphile” by vividly introducing me to 19th century New York settings like the Five Points, and the Battery. A wonderful read.